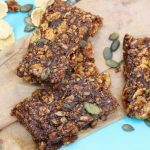 I created this recipe for fruit cereal bars in preparation for busier mornings. Last week ‘Roo’ started secondary school. Rather than leaving the house at a leisurely 8.40am she now has to leave a whole hour earlier. In anticipation of rushing about in the morning I thought these fruit cereal bars could act as breakfast in an emergency. So far, we’ve all been organised. I’ve made batter for waffles the night before; switched on the waffle maker before going out for a quick run with the dog; then returned and cooked said waffles while making lunches. All good, but I know it won’t last. My enthusiasm at the start of term never lasts more than a few days. And as the mornings get colder and darker I’ll be less inclined to leave my bed. On those mornings I think one of these fruit cereal bars might just step in. ‘Roo’ could eat one on the train if she had to, or could take one to eat at break time. Either way, they have the elements of a pretty decent breakfast. 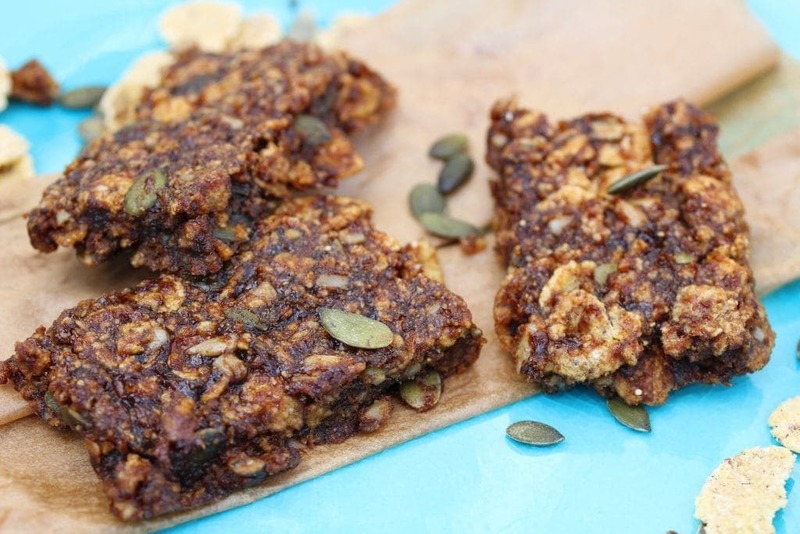 Nature’s Path Mesa Sunrise combined with dried fruit, coconut oil, molasses and seeds should provide enough good fats, fibre and carbohydrate to keep her fuelled until lunch. If you don’t like prunes or dates then swap them for other dried fruits. I chose them because they provide much needed fibre to the gluten free diet. They also provide antioxidants and nutrients such as vitamin K, vitamin B6, vitamin C, magnesium and boron. Boron is proven to build bone strength and is useful if you’re lacking in vitamin D. It is found in both dates and prunes in relatively high levels compared to other fruits. To add flavour and a little extra sweetness (and stickiness to bind the ingredients together) I’ve used blackstrap molasses. 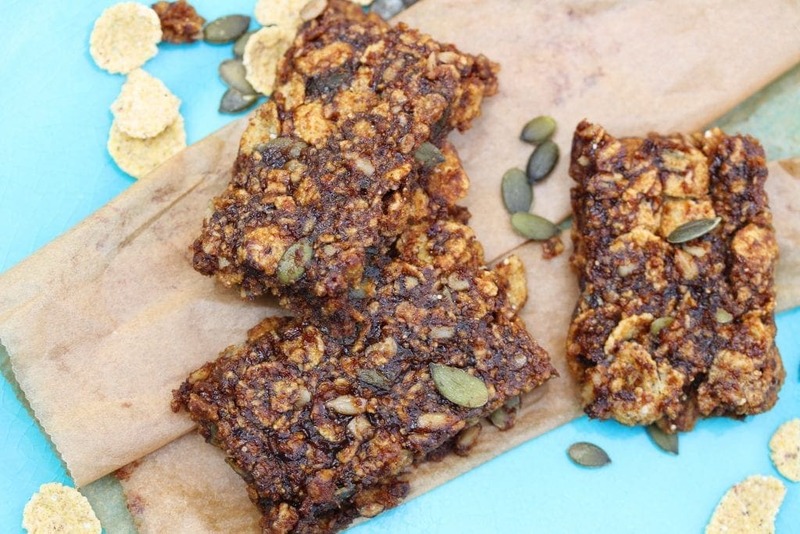 Unlike refined sugar it contains nutrients such as iron, calcium, magnesium and vitamin B6. 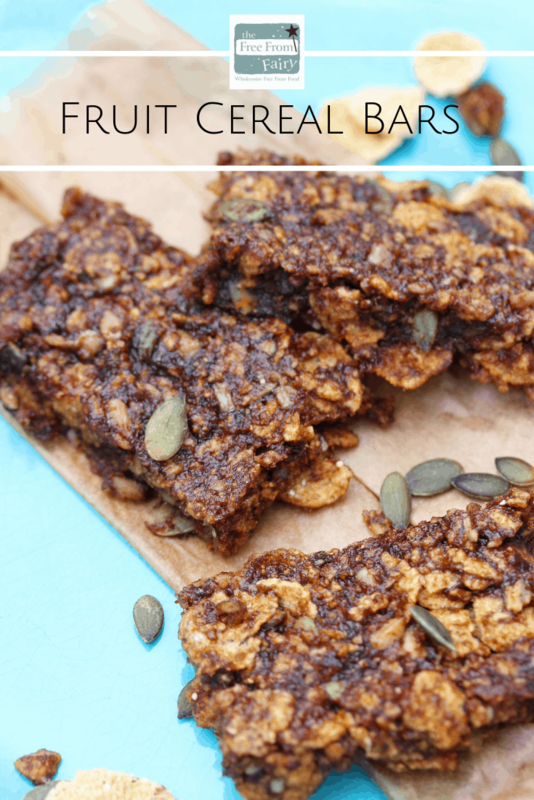 I’ve tried to keep the added sugar content of these fruit cereal bars low although they do contain naturally occurring sugars so don’t go crazy with them. 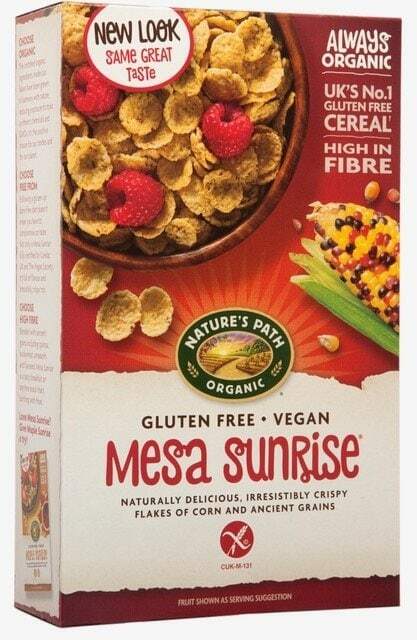 Finally, I’ve chosen Nature’s Path Mesa Sunrise to add the cereal component of the fruit cereal bars. It’s naturally high in fibre and adds texture to the bars. Look out for the new packet design! Those of you who follow my blog will know that I’m a big fan of Nature’s Path. 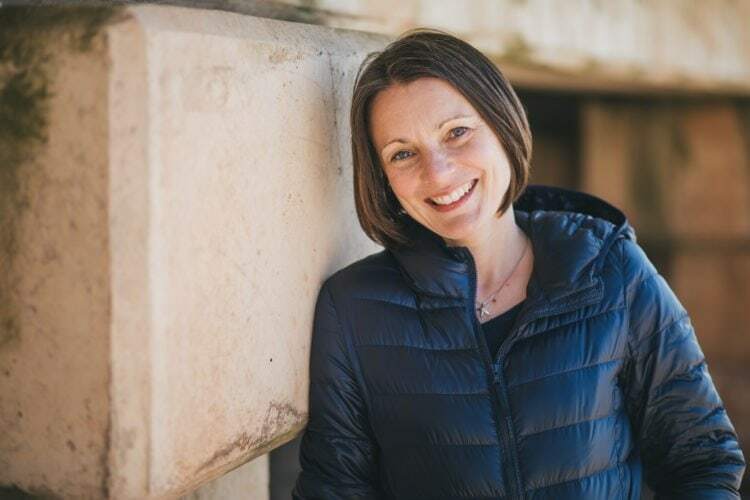 They champion sustainable cereal production using the finest available ancient grains. Mesa Sunrise are crispy flakes made from a unique, nutritious combination of corn, flaxseeds, buckwheat, quinoa and amaranth. And with no rice they make a welcome addition to a gluten free breakfast. Rice usually features heavily in a gluten free diet. For reasons why you shouldn’t eat too much rice check out this article I wrote for Metro. Almost all of the Nature’s Path range is gluten free, vegan and always organic. Every product is made using methods that do not involve synthetic pesticides or chemical fertilisers. They also never contain artificial additives or genetically modified ingredients. I think I’ve told you enough now to excite you about the recipe so here it is. If you’d like to buy the Mesa Sunrise you’ll find stockists here (RRP £2.99). I buy it in Tesco. This is a collaborative post with Nature’s Path.